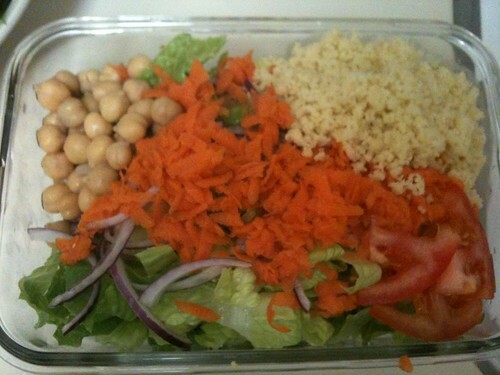 Appetite for Reduction | Hot vegan chick.....peas! I can’t believe it’s 85 degrees at the end of September! Wait, yes I can! As a native southern Californian (and current Bay Area transplant) I have never experienced a true fall. Crisp winds, dim sunlight, colored leaves, cozy coats, and hot soup…these are the things I dream of. I know “the grass is always greener” and such and when I inevitably have to move somewhere cold and icky for my post-doc in a few years I know I’ll long for coastal California weather. Until then, I’m going to complain and use the heat as an excuse to have cold, raw food for breakfast lunch and dinner! Today for lunch I went to a little cafe on campus and had the best best best salad (I actually have it almost every day). It’s got romaine, grape tomatoes, red onion, sweet white corn, black beans, jicama, and tortilla strips on top all tossed in a cilantro lime vinaigrette. Nothing special but it tastes amazing and they give you the most gigantic bowl along with some French bread so it’ll keep you full till dinner! I forgot to take a pic but I think you get the idea! 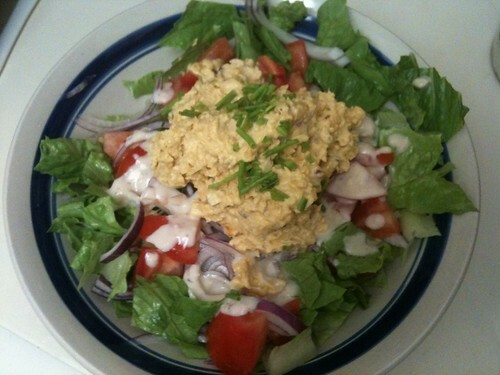 Chick peas are absolutely amazing in mayo-based mock-meat salads. I’ve seen them used in place of tuna (with a little sea weed flavoring to add “fishiness”) and chicken. I know I probably swiped this recipe from a cookbook but now I just kind of wing it. Mash up chick peas with a fork or in a food processor. Add onion, celery, curry powder, and enough mayo to moisten everything. Add salt to taste. Serve on salad or in a veggie sandwich! I just threw some on top of my salad (the white stuff is a little ranch dressing from Appetite for Reduction) with some chopped chives. Simple, healthy, and yummy! While I was making dinner I used leftover veggies to make salad for lunch tomorrow. I grabbed a handful of chick peas from the can I used to make chicken salad with and made a little cous cous while I was chopping, and voila! The recipe comes from Appetite for Reduction, but it’s a pretty basic concept. I think the book calls for quinoa but I didn’t have any so I subbed cous cous and it’s still really tasty. There’s also some romaine, carrot, red onion, and tomato. It’s not pictured but I used the balsamic vinaigrette from AFR too. That stuff is awesome! It doesn’t use any oil and all the fat comes from pureed cashews. Genius! And it’s amazing on this salad. 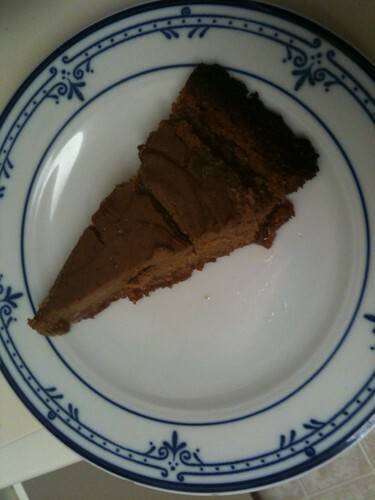 It’s not beautiful, but it was really good and you can’t really tell the difference from non-veg pumpkin pie. I used pumpkin pie filling and just mixed in a package of pureed silken tofu and a little more spice (cinnamon, ginger, cloves, and allspice). I hate most crusts so we made a cinnamon graham cracker crust instead. My oven is stupid and I burned edges a bit so it’s a little ugly but still tasted fine! 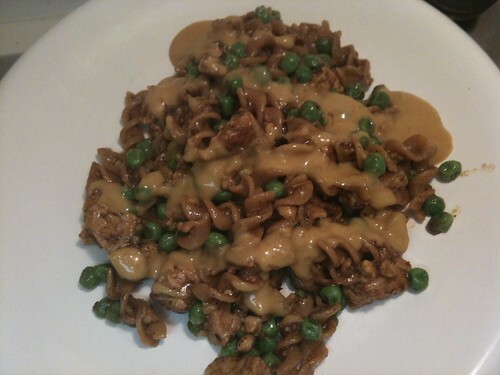 I never thought I would ever crave Hamburger Helper again but guess what…I’m not the only vegan who remembers and wants to recreate the stuff! This recipe is from Appetite for Reduction and uses tempeh as the meat substitute. It tastes like the taco flavor, with oregano, thyme, and chili powder in the noodle mix and topped with a nutrtitional yeast based cheesy sauce. Tasty! We added peas to bulk it up and get our dose of veggies.